The native nations and early settlers of eastern North America once looked upon the virgin forests of the area and saw an ecosystem that is considerably different from the one we know today. The trees were ancient and towering, and the food chains involved life forms which we do not see nowadays. Passenger pigeons, for instance, visited the primeval forests in enormous flocks, dependent on the nut crops which a certain tree produced reliably every autumn. We do not see many passenger pigeons today, though they were the world's most abundant bird a few hundred years ago, and the reason is simple: The last breeding colony was savagely harvested for food and oil in the late nineteenth century like a pen of broilers, as though it were grantedly human property, leaving the last individual to drop dead in 1914 in the Cincinnati zoo, where her lifeless body remains gracelessly perched to this day, stuffed and glassy-eyed. The reduction of the world's most abundant bird to an ugly carcass in Cincinnati dramatically illustrates how far some human beings are capable of going to feed self-centered whims, a fact which may explain why many people today resist being exposed to reminders of such holocausts that have impaired the health of our forests and disgraced our own species beyond measure. The great tree which sustained the passenger pigeon each year and abundantly dominated the eastern forests is the subject of this article - for it too is now absent from the forest canopy and in real danger, thanks to comparable human carelessness, of being reunited with its former avian patron. If you, like all too many of us, have never heard of this tree, please be warned that you are about to discover a species that you will know you should have been introduced to long ago. You will agree, perhaps with knots in your stomach, that it is truly baffling why so many of us never learned about the one species which until recently was by far the most dominant canopy tree in eastern North America and veritably the backbone of the eastern forest ecosystem. This writer, although a long-time naturalist, did not discover the truth about this tree until the age of twenty-two, nor the passenger pigeon until the age of sixteen, and upon learning the unsettling facts, could not but wonder, "What is the matter with our schools?" Far from deserving its usual treatment as just another native plant, this tree was effectively the emperor of the eastern forests, as its reliably abundant nuts each fall alone supported the large numbers of animals that our forebears beheld - animals including moose, elk, bears, wolves, wolverines, mountain lions, turkeys, and even a few insect species that recently may have become extinct. It also was our most economically important tree, as it produced durable, top-quality wood up to 50 percent faster than oak - wood which was used for practically everything from houses and furniture to railroad ties - as well as a major cash crop for "roasting on an open fire." Do these last few words stir your memory? Perhaps you have heard of this tree after all - in connection with a popular song of the holiday season! Thoroughly familiar with the American chestnut (Castanea dentata) in connection with much more than a mere Christmas carol, our grandparents annually roasted ample supplies of the sweet nuts, which they ate like pistachios and used as an essential ingredient for traditional stuffing. The nearly four billion American chestnut trees that thrived in their generation gave them quantities of nuts so vast that they probably thought they could never run out. Fully one tree out of four in the old-growth Appalachian forests which they beheld was an American chestnut; indeed, the Appalachian forests in some localities were entirely chestnut and were composed of examples of monstrous sizes sometimes approaching 130 feet in height and 10 or more feet in diameter. The chestnut's mature form was similar to that of oak, to which it is closely related, but its dimensions were so huge, its growth rate so rapid, and its prevalence so vast, that it was commonly known as the "redwood of the east." In July, masses of white flowers spectacularly covered many mature specimens, producing the unique effect of "summer snow," as it was popularly called, and the wind carried pollen abundantly from these conspicuous male flowers to the female flowers of nearby chestnut trees - flowers which later ripened into dangerously sharp, prickly burs that would split open in early autumn to release usually three nuts each. (Chestnut trees are not self-fertile and must cross-pollinate to produce viable seed.) Not to be confused with the unrelated horsechestnut (an imported tree related to the native buckeye), the American chestnut can be recognized easily by its long-pointed, sharply toothed leaves. The leaves of the related American beech are more stout and bluntly toothed, and the beech is easily distinguishable from all other native trees by its unmistakable, light-gray bark that never loses its smooth texture. The beech (Fagus), the true chestnut (Castanea), and many species of oak (Quercus) comprise the entirety of the beech family (Fagaceae) in eastern, temperate North America. In case you have not noticed, we obtain our chestnut crops nowadays from supermarkets, where we are forced to settle for the relatively insipid European imports. The few people living today who have tasted the nut of the American species are either senior citizens or highly fortunate, relentless naturalists like this writer, who can affirm from a rare, privileged experience that the nuts are indeed quite tasty. Similarly, while our lumber supply centers provide us with the finest wood of almost every variety we could hope for, the most highly esteemed of all native lumbers has been hopelessly out of stock for half a century - and what a shame, for chestnut wood was supremely tough, water-resistant, as rot-resistant as redwood, and easier to grow than oak. The planting of a few exotic chestnut trees (possibly the Japanese chestnut) in or near New York City shortly before 1904 quickly proved to have been one of the most tragic mistakes of the century. In those days of environmental ignorance, it did not occur to most people to consider the potential hazards that exotic imports and the parasites which they may host can pose to native wildlife, just as few people had seemed able to entertain the idea that ransacking the last colony of passenger pigeons may make it difficult for their grandchildren's offspring to "have pigeon for dinner." If one of those imported chestnut trees happened to be infected with a bark-shattering parasite, "So what? What could that possibly have to do with the price of stuffing?" Nor did most people bother to speculate, incidentally, that English sparrows followed by European starlings might not constitute wise solutions to a caterpillar infestation in Central Park; not only did neither species eat those caterpillars, but we now have great masses of starlings and English sparrows from coast to coast, damaging a variety of habitats, crowding woodpeckers out of nesting holes, and threatening the survival of bluebirds. As for the several gypsy moths that were left over from a Tufts professor's experiment on silk production, these were simply released into the air to become the ecological nightmare we know today. The bark-shattering parasite which was introduced accidentally into North America with that fateful planting in New York was the chestnut blight, a fungus of Asian origin and possibly the most efficient host-specific tree destroyer known to plant pathologists anywhere in the world. Its record of devastation greatly surpasses that of the Dutch elm disease fungus, as it caused by far the greatest ecological disaster in the history of the world's forests - a legacy unmatched by gypsy moths and acid rain combined. Our grandparents, preoccupied with national depression and war, watched only halfheartedly as the blight spread with amazing swiftness throughout the American chestnut's extensive native range in eastern North America and quickly destroyed over 99.99 percent of the chestnut population - almost all of nearly four billion trees - annihilating at least six specialized insect species, decimating wild turkey populations, and depriving humans of a priceless resource. The effect upon countless life forms of this sudden loss of our ecological backbone was not slight, as no other tree in the area yielded reliably abundant crops of nuts each year. Many animal populations were reduced substantially as they were forced to adjust their diets to include more acorns and other seeds. A senior relative of this writer happened to note the widespread prevalence of American chestnut trees in his Massachusetts home town before he left for college in 1928. When he returned home in 1932, as I understood his words, there was not a single mature chestnut tree to be seen anywhere in the area. By most accounts, sure enough, the majority of mature specimens were dead by 1940. Indeed, there are so few mature American chestnut trees left anywhere in the world today that the species is now threatened with extinction in the foreseeable future. Healthy specimens effectively have ceased to exist, with only the rarest exceptions, and natural reproduction is essentially nil. Extinction would be imminent if it were not for the tree's remarkable capacity for sending up vigorous new shoots, albeit infected ones, from surviving root systems which the blight ordinarily cannot destroy. Hence, the species survives in fair quantity, but almost entirely in the form of stunted understory shrubs which seldom are able to reach a reproductive maturity before the blight gains its stronghold and girdles each sprout near its base, forcing the root system to send up new sets of shoots continually. Obviously, such a life-style as this cannot persist indefinitely, if much longer! The Western hemisphere's only other species of true chestnut with a timber-type growth form, the European chestnut (C. sativa), suffered the same fate to a lesser degree after the blight was introduced similarly into Europe in the 1930's. The Chinese chestnut (C. mollissima) and the Japanese chestnut (C. crenata) are much smaller trees with orchard-type habits, both of which are resistant to chestnut blight, having evolved with it in Asia. Most of the world's remaining species of true chestnut (Castanea) are low shrubs, some of which are commonly called chinquapins. The blight also grows on the native scarlet oak, but it causes little damage to that species. 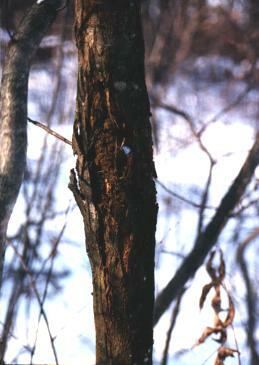 The spores of the chestnut blight fungus are carried from one tree to another by various factors including wood-boring insects and woodpeckers. Infected limbs develop swollen, discolored bark followed by massive, bark-shattering cankers, usually near their bases, cankers which almost always girdle the trees within a few years. While individual cankers often can be healed through airtight applications of ordinary wet mud, thereby slightly prolonging the life of a tree, there is no known cure for blight infection. The prospective development of hypovirulent blight strains, as well as biological controls which attack the blight, may help to preserve for a little longer the genetic diversity of the remaining American chestnut trees; however, they cannot realistically restore permanent health to a tree, nor the species to its former majestic prevalence. Only the development and planting of truly blight-resistant stock could bring about, potentially, a long-term restoration of this species to its rightful place in our natural heritage. The eventual return to the landscape of mature, healthy American chestnut trees is now a promising prospect, thanks to the long-term efforts of a nonprofit organization, The American Chestnut Foundation (TACF). This organization is successfully developing strains of American chestnut with full levels of blight resistance derived from the genes of Asian chestnut species, and seeds from these breedling lines now are being offered for evaluation purposes to senior and "Annual Sponsor" members of TACF, as supplies become available. When the time is right, the trees will be released into the public domain and made available to the general public with no restrictions, thus making it realistically possible at last for us to begin restoring this irreplaceable ecological keystone to its proper place in our parks, yards, forests, stuffing recipes, and lumber selections. This writer hopes and fully expects to be among the first to set an example in this noble venture, just as I currently am helping to restore the American elm. 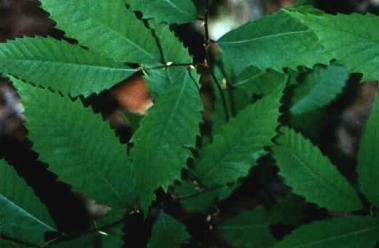 The development of these blight-resistant American chestnut trees is being accomplished through "backcross breeding," which means that hybrids between American and Chinese chestnut trees are repeatedly crossed back onto purely American specimens, yielding offspring which then are inoculated with the blight and screened for resistance. Those showing the highest levels of resistance are again backcrossed onto the pure American species, and this process is repeated for several generations until strains result that are almost purely (93.75 percent) American and indistinguishable from the American species, except for high levels of blight resistance derived from a single Chinese chestnut ancestor. These strains are then intercrossed with each other to recover the full blight resistance of the Asian species and to ensure that further offspring will breed true for this trait. (More information.) Genetic experiments have proven that this breeding plan indeed will work and have demonstrated that blight resistance in chestnut trees seems to be controlled by two pairs of incompletely dominant genes. State chapters of TACF in the majority of states from Maine to Georgia are replicating this program, each using local plant material for the purpose of yielding lineages that are adapted to its particular climate. The Virginia and Pennsylvania chapters appear to be ahead of the others in the progress of their chestnut breeding programs, and seeds and seedlings from those lineages now are being offered to some TACF members for purposes of long-term, cooperative evaluation and field testing, in accordance with signed germplasm agreements. In most states it will take at least a few more years for seeds from local strains to become available. An American chestnut tree from Virginia possibly would grow well enough in Massachusetts, but TACF considers it inadvisable to plant these trees on a large scale too far from their local region of origin. Rather than making haste to plant quantities of chestnuts at the outset, some of us might do better to keep in mind that good things come to those who wait; in the meantime, unselected, blight-susceptible American chestnut seeds or seedlings can be purchased from various sources, although such stock would have little value for purposes of restoration. With all due respect to other organizations and individuals who are working on issues related to chestnut blight, I am not aware of any that are handling the problem in this same way or yielding chestnut trees with the full level of blight resistance that will be necessary for long-term survival and true restoration of the species. Some people may be critical of the idea of using hybridized strains with traces of non-native genetic material for reforestation, but the best hope for the American chestnut in my opinion lies in the work that is being done by TACF, as no purely American chestnut tree ever has been discovered to have more than a fair capacity, at best, to fight off this extraordinarily potent killer. Anyone interested in further information may want to contact The American Chestnut Foundation (160 Zillicoa Street, Suite D, Asheville, NC 28801) and to consider becoming a member. Chestnut trees are extremely difficult to propagate vegetatively, although reportedly it is possible to propagate them by stem cuttings taken from the vigorous greenwood shoots of young saplings, and also by other techniques, such as tissue culture. My repeated efforts to root chestnut cuttings have been unsuccessful; however, American chestnut seeds sprouted for me in quantity with a success rate exceeding 50 percent, on the one occasion when I was able to acquire them. It is clear that seed sprouting is the only method of propagation of this species that is likely to yield satisfactory results for most people. Seeds collected in the fall (by those who have been fortunate enough to acquire them) can be stored throughout the winter in a container of moderately moist peat moss placed in the refrigerator, and then removed for indoor sprouting in March or April, when they may have emerging roots. In northern climates, newly sprouted American chestnut seedlings can be transplanted outdoors in May, after they have developed their first permanent leaves. When transplanting these seedlings outdoors, it is vitally important to snip the nuts off of the growing sprouts so that the seedlings will not be demolished by hungry squirrels. Permanent planting locations should provide direct sunlight and soil that is fairly moist but well drained, and preferably moderately acidic. Like oaks, chestnuts prefer relatively dry soils away from wetlands, as they develop deep taproots that allow them to exploit underground moisture and to tolerate relatively poor topsoils - although a moderate amount of rich, moist soil should be provided for the initial establishment of young saplings. American chestnut trees grow extraordinarily fast when planted in ideal conditions. The presence of native mycorrhizal fungi in the soil appears to be highly beneficial to American chestnut saplings, by some accounts making the difference between mediocre growth and the phenomenal rate of growth for which this species is noted. In optimal conditions, these trees have been known to reach about twenty feet in five years. With adequate resistance to the blight, they would have the potential of living for hundreds of years; however, we should not lose sight of the fact that American chestnut trees from wild-collected seed have no resistance to the blight and are almost certain to contract it and to succumb not too many years after planting. It may be valuable to know also that extraordinarily high concentrations of phosphorus in the soil have been known to induce prolific flowering in American chestnut trees as young as two years of age, a fact which has expedited greatly the breeding program of The American Chestnut Foundation. Too many times, we humans have blatantly disregarded our common sense in regard to the rights of other life forms with which we share this planet. Too many times, we have discovered the hard way that an aggressive organism carelessly introduced into an ecosystem in which it does not belong will often spread unchecked, causing large-scale devastation and costing us priceless resources, not to mention many millions of dollars. Too many times, we have been needlessly pained to find a way to repair some kind of horrific damage which easily could have been prevented with the smallest trace of intelligent foresight. Thanks to good fortune, the American chestnut probably will be saved, as the power to restore it soon will be in our hands, and our sentimental song about chestnuts roasting on an open fire may no longer sound quite so eerie. But barring the possibility of a miracle (a far fetched prospect which incidentally this writer carefully avoids ruling out), the passenger pigeon that once depended on native chestnuts will never again be observed to darken the skies above our heads, nor will a number of other unique animals that once gorged on chestnuts ever be seen again. The heath hen upon which the Plymouth pilgrims feasted has been seen for the last time. The eastern bison will no longer live near Buffalo or anywhere else, nor will the once-abundant Carolina parakeet, which was the only parrot native to North America. The last Carolina parakeet now stares lifelessly through the plastic eyes of a stuffed carcass permanently perched in the Cincinnati zoo next to the hideous gray mass which once was the world's last living, breathing passenger pigeon - and most of us have never even heard of these species, any of which as easily might have been the blue jay. This one tree ... can help make it plain to those who still do not understand, that ... concerns which sometimes appear to be at odds with one another are deeply interconnected. When the forests die, it isn't just the wildlife that suffers, nor just the tender-hearted. We humans have a cold, hard, cash interest in seeing that our ecosystems stay healthy. When the tree was hurt, so were we; and badly. As a tool to teach that lesson, the American chestnut is unexcelled. Boiled Chestnuts: Cut a V-shaped notch in each nut with a small, sharp knife. Boil nuts in a saucepan until just tender (about 15 minutes). Remove nuts from water and let them cool somewhat. Remove shell and papery brown skin while nuts are still warm. One pound of nuts makes about 2 cups. Roasted Chestnuts: Cut a V-shaped notch in each nut with a small, sharp knife. Preheat oven to 350 degrees F. Place nuts on a baking sheet and bake for 10-15 minutes, turning nuts at least once. Remove nuts from oven and let them cool somewhat as soon as nuts begin to release steam and the nutmeat possesses the soft, fluffy texture of baked potato. Remove shell and papery brown skin while nuts are still warm. One pound of nuts makes about 2 cups. * The American Chestnut Foundation. My favorite chestnut organization. Research and Restoration. Details on TACF's chestnut breeding program. * American Chestnut Cooperators Foundation. Another chestnut restoration organization. J. Hill Craddock's Chestnut Links. 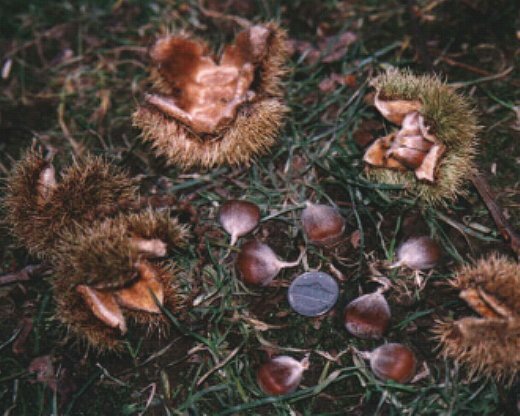 Many more links to chestnut-related articles. Source List for Chestnuts. More sources for American chestnut seeds or seedlings. Ozark Chinquapin Foundation. An organization dedicated to the restoration of the Ozark Chinquapin. Currently, I am working on a special project through which I am propagating and raising disease-resistant, purely American elm trees for distribution to local conservation areas and sale to organizations and residences. Please visit my article, Saving the American Elm for more information on this project, including many links to sources of trees, information, and photographs. The article also describes the history of Dutch elm disease and provides links for anyone wishing to research this subject further. I also am an avid gardener of native New England wildflowers and maintain native wildflower gardens at home and at the Acton Arboretum in Acton, Massachusetts. My picture-article, The Wildflower Trail at the Acton Arboretum, provides an illustrated tour of this special garden and presents tips on how to cultivate a selection of attractive native species. The photographs on this page may be distributed freely or republished for wholesome purposes; in return, a credit link ("courtesy elmpost.org") is always appreciated.